How to trap a Raccoons? 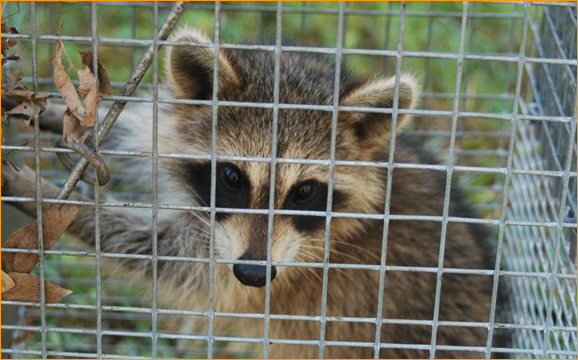 How to trap a Raccoon is a very common question that we receive in our email bag each and every day, this seems to be one of the bigger problems that people in urban environments experience every day. Either the raccoon is knocking over the garbage can, getting into the cat door or just simply decided to move into the attic of your home to have babies. They are a nuisance! Let us talk about Raccoons before we tell you how to trap them! Raccoon Control, what Kind of damage do they actually do? Raccoons are one of the most destructive animals in the United States, the Insurance industry estimates that the damage caused by raccoons to homeowners are in the hundreds of millions of dollars. One interesting thing that many insurance companies do not want you to know is that most Raccoon damage in attic areas of home is covered to be fixed by your homeowners insurance. There is some qualifications that need to be met before the insurance companies will pay for it. You can find a qualified raccoon removal specialist here. One of the main problems with raccoon is getting raccoons in your house. We get a lot of emails from unhappy homeowners who used to have a well manicured yard. They woke up one morning and it looked like a series of bombs has went off, what happened? Raccoon is digging for grubs is the short answer! A healthy lawn that is full of nutrients and lush grass also has a complete echo system growing bellow it, a raccoon know that if he digs into that lush yard he will find the inhabitants and they are rather tasty to him! Raccoons love to eat grubs and Japanese beetles that are found in your healthy yard. The only way to cure this problem is to trap the raccoon or kill the grubs and beetles that he is after. However killing the grubs and beetles is not the best advice a lawn service will give you in order to keep your yard looking lush and green, The best solution is to trap the raccoon! So How do I Trap a Raccoon?